It is absolutely pouring out today... but luckily I have the PERFECT rain boots to brave such weather! 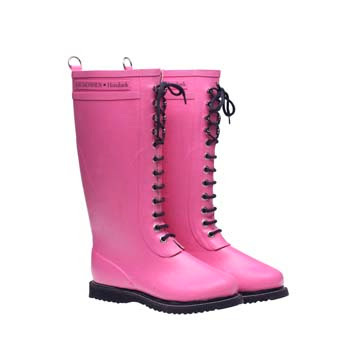 These fabulous pink rain boots are from Ilse Jacobsen, which is a Danish based company. I got them in an upscale pet shop in Vancouver a few years back. At the time, I thought it was crazy to spend so much money on rain boots (even though it was actually my mother-in-law's money!) While we do not get a ton of rainy days here in Winnipeg, these boots have saved my feet on many days!! We just got back from play group, and the Littlest Linden is down for a nap. The playgroup we go to on Thursday afternoons is for babies under 1 year, and it's put on by the public health nurse. Each week there is a different guest speaker on topics such as 'Feeding your baby solids', or 'Getting back into shape'. After the guided discussion all the moms and babies can stay and chat, play, and eat some healthy snacks. It's a fun Thursday outing, and I have met some really great moms and babies in the 7 or 8 months that we've been going. Now that Soren and his little friends are in the 'Big Kid' group (since the cut-off is one year) it's amazing to see how TINY the newborns are! I remember bring him back in October, and thinking that the older babies seemed so big! While I knew he would grow up, it was almost impossible for me to imagine him sitting up, standing, interacting with other babies, etc. He would sit/lie in my arms and I would chat to other moms. Now I am tearing around the room after him, making sure he doesn't accidentally fall on one of the newborns or put someone's shoe in his mouth. I'm enjoying the coziness of the rain and it's motivating me to do some house chores, such as cleaning out the fridge and updating Soren's baby book. I'm going to make chicken enchiladas for dinner - which is strangely enough the Littlest's favourite food. I'm also making some sugar cookies that I'm going to cut out and decorate for Easter. I plan on getting the babe to help, but since I anticipate he'll be more trouble than help, I am going to wait for my husband to come home before I break out the food colouring. I need an extra pair of hands in case he suddenly grabs for a bowl of icing! Those are cute boots, it's funny you found them at a pet shop! Those boots are so fabulous! I love the color.